Finding the right wood flooring is more complicated than you might think. Unlike with most flooring types, determining which wood floors are best for your home is about more than just what’s most aesthetically pleasing. There’s a lot to consider when it comes to buying wood flooring, and the average homeowner doesn’t always know what to look for. But, the good news is that the flooring contractors in New Jersey at Floor Expo are here to help. 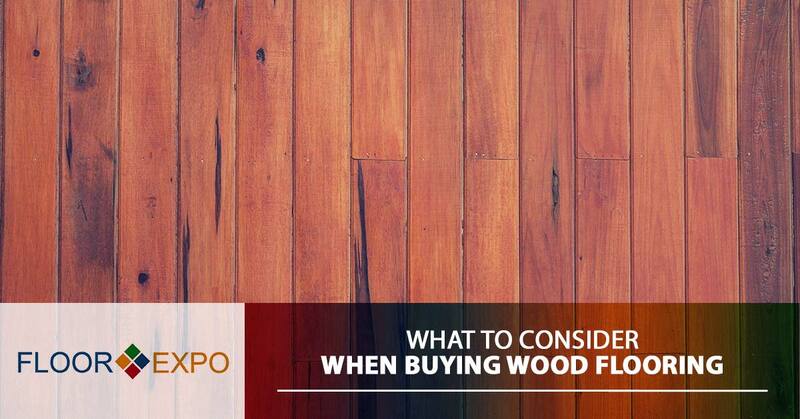 Here’s a quick buyer’s guide on what to consider when buying wood flooring. The first decision you’ll want to make when determining which wood flooring option is the best for your home is whether you want to invest in solid or engineered wood flooring. Solid wood flooring is comprised of solid wood, just like it sounds; while, engineered wood flooring is comprised of several, thin layers of real wood laid out over a base made of plywood. Solid hardwood is more durable than engineered hardwood, and can be refinished multiple times. However, it’s more prone to warping and buckling when it’s exposed to moisture than engineered hardwood, and unlike engineered hardwood, it’s not suitable for areas below grade. Determining whether you want solid or engineered wood flooring is ideal for your first choice, because it will narrow down your options for subsequent decisions, especially if you choose engineered wood flooring. Want to learn more about the differences between solid and engineered wood flooring? Check out our blog. Regardless of whether you’ve chosen solid or engineered wood flooring, you’re next decision will be whether you want to buy prefinished or unfinished flooring. Although, if you choose engineered wood, you might have a harder time finding an installer who will provide you with unfinished flooring. Prefinished means that it is sanded, sealed and finished by the manufacturer, and unfinished means that raw wood is installed, then sanded, sealed and finished right in your home. In general, prefinished flooring is easier to install and more scratch resistant, but is difficult to repair and refinish, and has fewer design options; whereas, unfinished flooring requires professional installation that can take days, can be refinished multiple times, can be customized and is available in many different wood species, but it doesn’t stand up to wear and tear quite as well. Want to learn more about the differences between prefinished and unfinished wood flooring? Check out our blog. Another important decision you’ll need to make is between softwood and hardwood. To make matters even more confusing the terms, “hardwood” and “softwood,” don’t actually describe the density or hardness of the wood itself, but rather the type of tree it comes from. Hardwood is derived from flowering trees, which are called angiosperms; whereas, softwood comes from trees that stay green all year, called evergreen trees. Hardwood is, by far, the more popular choice when it comes to flooring, because it’s much more durable and easier to finish than softwood. However, softwood still does have a place in the wood flooring world. Softwood is often chosen for floors because it looks exactly like hardwood, but it’s not quite as expensive, and it can work well for rooms that don’t get a lot of heavy foot traffic. Common hardwood species include oak, walnut and maple, and some common softwood species include pine and spruce. Want to learn more about the differences between softwood and hardwood wood flooring? Check out our blog. Once you’ve made your choice about the above decisions, your options for species will be a lot more limited, so luckily, choosing a wood species shouldn’t be too much of a challenge. But, still, it’s important to do a little research and think about more than just how a certain species looks. The differences in wood species amount to more than just aesthetics. Species can determine a number of things, including how hard and durable the floor will be, how long it might last, how many times it can be refinished, how expensive it will be, how much time the installation will take, etc. Want to learn more about the differences between wood flooring species? Check out our blog. If you choose to invest in unfinished hardwood flooring, you’ll have an additional choice to make — the finish. There are many different kinds of finishes available for wood flooring, and choosing the right one is important for many reasons. Not only does the finish you choose play a big role in determining how well it stands up to abuse and how long it can potentially last, it also makes a big difference in how your flooring looks. The finish you choose will affect everything from the color of your floors to how much luster they have. Want to learn more about the differences between wood flooring finishes? Check out our blog. If only choosing wood floors would be as simple as just picking the one you think looks best. Alas, as you can see, there’s a lot more to it than that, but with Floor Expo on your side, finding the right wood flooring doesn’t have to be a challenge. Our specialists have years of experience in helping our clients find the right flooring options, and our design consultations are free, so you have absolutely nothing to lose. Schedule your free design consultation today, or feel free to stop by our flooring showroom in Fairfield to check out all of the options we have available to you.